In the historic part of Uptown New Orleans, LA is the Audubon Zoo, home to a mix of exotic animals from around the world. With a variety of unique exhibits, hands-on experiences, and programs, the zoo inspires visitors to learn more about the animals. The zoo is part of the Audubon Nature Institute, which is a collection of 15,000 animals housed at 10 museums and parks. With sculptures and the historic early 1900s architecture as a backdrop, the zoo's beautiful buildings and lush gardens enhance the experience of exploring the park. The Audubon Zoo strives to provide education to visitors to the animal kingdom by exhibiting a range of wildlife. Working with the community, the zoo is also a hub of learning, with a number of exhibits that teach visitors about animals, conservation efforts, and the natural world. 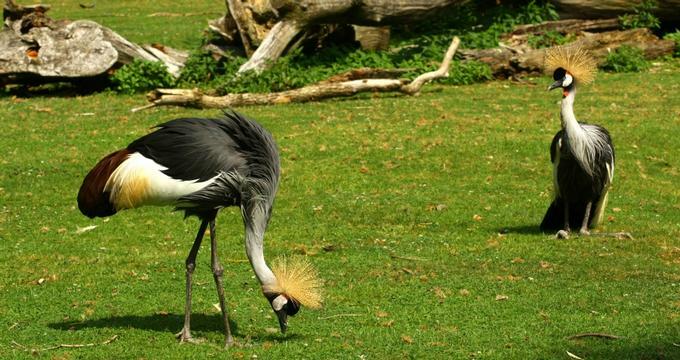 The variety of the exhibits offered at the Audubon Zoo provide a fun way to learn about the animal kingdom and the relationship between nature and people. The exhibits take visitors on a trip around the world to see animals from all regions of the Earth. The thousands of different animals in the zoo have exhibits that explore different mammal habitats such as the African Savanna, Watoto Walk, Jaguar Jungle, the World of Primates, Asian Elephants, Audubon Aviary, and the award-winning Louisiana Swamp exhibit. In the African Savanna, there are zebras, giraffes, and monkeys, located directly beside the Watoto Walk. In this outdoor exhibit, designed after a Maasai village in Kenya or Tanzania, kids have a place to interact with sheep and goats roaming around. The village has a round thatched hut that is an educational area to teach children about the different Nigerian dwarf goats, Gulf Coast sheep, and many other animals. Moving to the natural environment in South America, the Jaguar Jungle exhibit has a new perspective on the ancient Mayan civilization. Being the most sacred animal in Mayan culture, the exhibit on jaguars has a display that teaches visitors about the culture, people, environment, and animals in South America. Enclosed in glass, people have an up-close view of the jaguars, which stalk around the recreated Maya ruins. The World of Primates is home to monkeys from around the world, and visitors can watch as these gorillas, lemurs, and mandrills play and interact in their habitats. Asian elephants are a magnificent aspect to the zoo, and visitors may use an elevated pavilion to watch as the elephants cool down in one of two pools, using their trunks to play in the water. Housing more than 30 species of colorful birds, the Audubon Aviary displays beautiful and tropical birds from around the world, like the bright, little Taveta golden weaver. There are many endangered birds in this exhibit, such as the blue-crowned laughing thrush from the northeast of China. The Louisiana Swamp exhibit, which displays the wildlife, history, and culture of Louisiana, is an award-winning feature at the Audubon Zoo. This exploration of the relationship between plants, swamp animals, Cajun people, food, and society in the Deep South is a unique cultural experience. In the history of Louisiana, the Native American people taught the Cajun people how to live on the land without overusing its resources. It offers visitors an opportunity to learn about local habitats and environments through unique activities such as alligator feedings and up-close encounters with animals. There are many different events and programs on offer at the Audubon Zoo for people of all ages. Each day there are unique presentations about different animals in the zoo, however there is also a variety of specific events, such as those that allow visitors to explore the zoo at night. These include the Nature Center Flashlight Tours, Safari After Dark, and Scout Programs. The Nature Center Flashlight Tour is a new way for visitors to explore the entire nature center, including the zoo, by being able to hear how the forest comes alive after the sun sets. Using flashlights, guests can see night-blooming plants and may conclude their evening by roasting marshmallows at a fire pit. Safari After Dark is another nighttime experience that allows visitors to camp at the zoo. In the evening there is a variety of family activities, such as animal encounters and crafts beside the fireside as well as a night hike around the site. The Scout Programs allows Girl and Boy Scout units to reserve a night to camp at the zoo and have an up-close experience in nature surrounded by animals. Participants even have the option to earn an eco-badge during the overnight experience.